A little sideways shift in our breeding program as the crop of partbreds in Australia dwindle. We'd like to welcome Paint mare, Hustle Me Dreams to the herd. 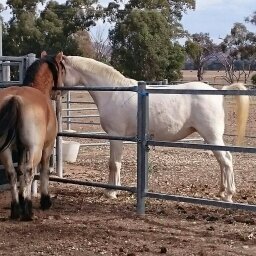 Known affectionately as River, she carries a chestnust base plus the white patterns overo and sabino. We are hoping that when covered by a Highland she'll produce a beautiful western-style pony, heavily coloured,hopefully carrying dun (Adie is Dd, so 50% chance) with a bit of extra mane and tail. Fingers crossed. We should know by autumn 2017.